This USB-C to HDMI adapter lets you to output 4K video and audio from the USB Type-C port on your laptop to an HDMI display or projector. The adapter works with USB 3.1 or Thunderbolt 3 Type-C devices that pass a DP video signal, such as your MacBook Pro, Chromebook or 2018 iPad Pro. 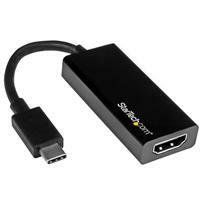 This video adapter is also available in white (CDP2HDW). 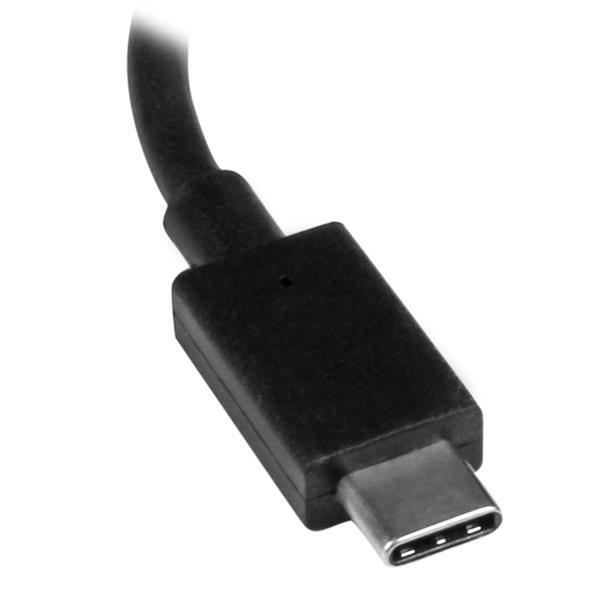 This adapter lets you harness the video capabilities from your computer's USB-C connection, to deliver the astonishing quality of UHD to a 4K 30Hz display. You can achieve an output resolution of up to 3840 x 2160p at 30Hz, perfect for performing high-resolution tasks. Plus, the USB-C display adapter is backward compatible with 1080p monitors and displays, making it a great accessory for any workspace application. This HDMI converter lets you use the versatile USB Type-C port on your portable device. USB-C is a reversible connector, so you can plug it to your device in any direction. Plus, it’s Thunderbolt 3 compatible, providing a hassle-free connection to your Windows or Mac based Thunderbolt 3 computer. This compact, lightweight USB-C video adapter is easy to carry in your laptop bag. It's ideal for BYOD (Bring Your Own Device) applications at the office and is compatible with any device that supports USB-C DP Alt Mode. CDP2HD is backed by a 2-year StarTech.com warranty and free lifetime technical support. We bought 10 of these adapters for iMacs in our college and 4 have already failed. They become intermittent having the hdmi output going up/down/up/down etc... We replaced them with a longer Startech usbc to hdmi cable which might reduce the stress on the usbc connector. We're sorry to hear about this problem with CDP2HD. It's unusual to see so many problems with this product. If this problem consistently happens with an individual computer, we recommend ensuring that your graphics drivers are fully up-to-date. If this doesn't fix the issue, we'd like to go through some troubleshooting steps to help find the root cause and, if needed, provide replacement units under CDP2HD's 2-year warranty. It looks like you're already in touch with one of our Technical Advisors, and we'll be happy to help provide a fix for this problem. I have tested this USB-C to HDMI dongle on several Lenovo laptops and my Galaxy S8 phone, with different 4k TV's, monitors and projectors without any issues. The dongle comes in a large zip logs bag without any padding or instructions. It must be a very durable product to bounce around a zip lock bag without any issues. The dongle is about the length of a pen and the larger HDMI end makes up about half the length. The HDMI end is made of shiny black plastic which was scratched all over within minutes of handling it. The cable and USB-C end are made of premium soft plastic and the cable is flexible while remaining sturdy. When I connected the dongle to my computer or phone it was immediately detected and started working within 5 to 10 seconds on first attempt then about 2-3 seconds on subsequent attempts. No installation was need and I didn't even need to click ok to anything. This is a great dongle, by far my favorite USB-C adaptor and try to keep with me as much as possible. I have started leaving it in my jacket pocket permanently as it works well for sharing my phone screen. I received this product in exchange for an unbiased review. (5 stars) Great adapter for the go bag! Works great, no issues. Its now part of my company's travel presentation kit allowing us connectivity to whatever devices we encounter on-site. Disclaimer: I received this product in exchange for an unbiased review. When plugged in the monitor flickers. Does not matter the display type. Thanks for letting us know about the flickering. We're very sorry for the technical difficulty. We'd like to make sure you have the latest software and firmware updates from Apple for your Mac. If the issue continues, our Technical Advisors can help troubleshoot the situation with you. To connect with one, please click Support at the top of this page then choose email, chat, or phone. I've used this specific adapter with a new Macbook Pro. I have connected to 3 different HP Envy32 B&O displays, and two flat screen TVs. Display quality is on par for all tested displays, but audio is choppy when only connecting to the display sound. TV audio works fine. After testing another USBC to HDMI converter with the same display audio works fine. Thanks for sharing your review. We're very sorry about the audio problem you encountered. If the problem happens on multiple computers, the adapter is likely faulty. We'd be happy to replace it for you. One of our Technical Advisors can help start that process. To connect with one, just click Support at the top of this page then choose email, chat, or phone. This adapter did not work with either a Toshiba Satellite or Lenovo Think Pad. Tested cables and monitor and they both worked. Problem is the Startech. The support page on Startech was not helpful. It said the device was plug and play. Thanks for sharing your experience with us. We hope we can help. 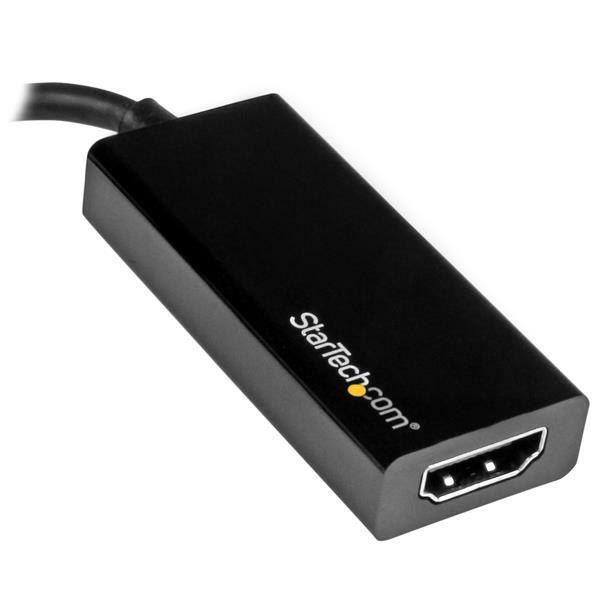 This adapter works with USB-C devices that pass a DisplayPort video signal. Since not all laptops with USB-C have this capability, it would be helpful to know the exact model of systems you tried. We also sent an email to you at the address provided with your review. We have Technical Support Advisors available 24 hours, 5 days a week.